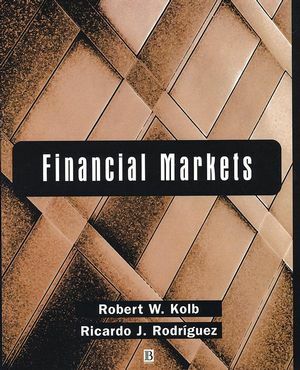 Financial Markets> provides a concise, yet comprehensive introduction to financial markets for undergraduate or MBA students studying finance or money and banking. The text employs an analytical approach to the role of financial markets in a modern economy, debt and equality markets, and derivatives markets and risk management. In each case, the discussions explore the financial economics of the area of study and focus on the application of finance concepts to practical business management problems. The material covering financial derivatives offers an extensive treatment of the topic, placing particular emphasis on how derivatives are used in risk management. * The text includes STUDY!, a computerized study guide that includes a bank of multiple choice questions covering all of the essential conceptual issues in the text. Professor Robert W. Kolb taught investments at the University of Miami until 1996. He is the author and editor of over a dozen books and numerous articles on finance and investments. Kolb currently devotes his time to writing and research, especially in the areas of futures markets, investments and bond portfolio management. Part I: Financial Markets and the Economy:. 1. The Role of Financial Markets. Part II: The Debt Market:. 4. The Level and Structure of Interest Rates. Part III: The Equity Market:. 8. Risk and Return in Securities Markets. Part IV: Financial Derivative Markets and Risk Management:. * Includes STUDY!, a computerized study guide that includes a bank of multiple choice questions covering all of the essential conceptual issues in the text. * A comprehensive Instructor's Resource Manual, including answers to end-of-chapter problems, answers to additional problems, a test bank with multiple choice questions for each chapter, and answers to test questions. * Data led and extensive coverage of financial derivatives and risk management.